How integration may be used to solve problems of curvilinear motion is illustrated in the following examples. Suppose a projectile is launched from the origin at an angle of elevation α and initial velocity v0. Find the parametric equations for its flight path. Position: x(0) = 0; y(0) = 0. If desired, t can be eliminated from this pair of equations to yield a parabola in rectangular coordinates. at any time t 0. At t = 0, x = 1 and y = 0. Find the parametric equations of motion. The particle in Example 5 is in motion for 1 second, 0 ≤ t ≤ 1. Find its position, velocity, speed, and acceleration at t = 1 and the distance it traveled. (a) Find the position vector R at any time t.
(b) Find a Cartesian equation for the path of the particle, and identify the conic on which P moves. 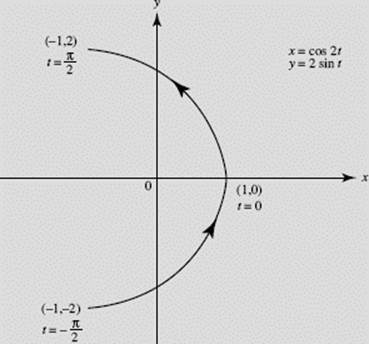 x = cos 2t, y = 2 sin t.
P travels in a counterclockwise direction along part of a parabola that has its vertex at (1, 0) and opens to the left. The path of the particle is sketched in Figure N8–1; note that −1 ≤ x ≤ 1, −2 ≤ y ≤ 2.